Photos of the Dream Lagoon..
Every morning I started the day with a rich fruits and sweets breakfast which was delicious. The resort had an all inclusive formula so all drinks, alcoholic and non, and food was free of charge. In the afternoon there were several pools to bath in or you could go and visit the Red Sea. In the resort there were also some small bazars, little markets where you could fine nice perfumes, clothes and souvenirs to bring back home. We also had a change to try the famous narghile, a typicial Egyptian waterpipe, and we tasted the local tea which was really nice. Another excursion which is worth your money would be the glass bottom boat tour. During the tour you'll be able to see some amazing marine life, like the colourful fish swimming around the coral reefs. Did you enjoy Great tours in Marsa Alam and have you been on a holiday in Marsa Alam, Egypt? 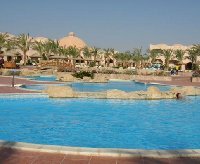 Photos of the Dream Lagoon Resort in Marsa Alam, Egypt. Liked: The sea, the resort and the tour in the desert which was an amazing experience! Disliked: Marsa Alam is a town of fishermen and you won't find a lot of cultural attractions. The best thing to do is to pay a visit to the city of Luxor.